Cairt o Sooth Sudan shawin the location o Juba. 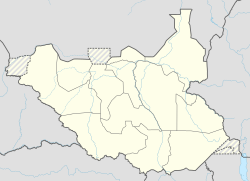 Juba (IPA: [ˈjuba]) is the caipital an lairgest ceety o the Republic o Sooth Sudan. It an aa serves as the caipital o Central Equatoria, the smawest o the ten states o Sooth Sudan. The ceety is situatit on the White Nile an functions as the seat an metropolis o Juba Coonty. Juba haes a tropical wet an dry climate (Köppen Aw), an as it lies near the equator, temperaturs are het year-roond. Houiver, little rain faws frae November tae Mairch, which is an aa the time o the year wi the hettest maximum temperaturs, reachin 38 °C (100 °F) in Februar. Frae Aprile tae October, upwards o 100 millimetres (3.9 in) rain faws per month. The annual tot precipitation is 1,000 millimetres (39 in). ↑ "World Weather Information Service - Juba". World Meteorological Organization (UN). Retrieved March 21, 2013. ↑ "Juba Climate Normals 1961-1990". National Oceanic and Atmospheric Administration. Retrieved March 21, 2013.